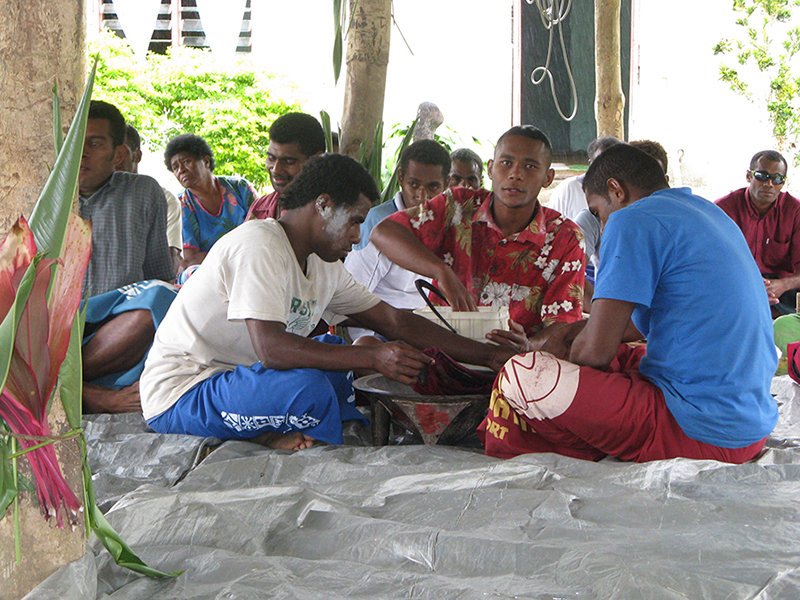 Visiting Fiji generally involves participating in a traditional kava ceremony. We attended one though I had some trepidation about the drinking of kava having read too many articles about the side effects. However, I really wanted to see the renowned kava ceremony and to visit a Fijian village. It was not the first time that I had been in contact with kava having seen it often in Samoa. However, as each island has their own rituals and practices we were curious about the ‘yaqona’ ceremony, as kava is known as in the Fijian islands. Kava is the name of a plant whose roots are dried, pounded into a powder and then placed into a cheesecloth bag. It is rung through with water to make a drink of the same name called “Kava”. Kava was named by the explorer Captain Cook because it means “intoxicating pepper.” While Captain Cook may have named Kava, he didn’t discover it as it has been around for a long time. It is consumed on ceremonial occasions by the Fijians, men and women alike, and also for any situation that warrants it. To be honest, the Fijians interpretation of an event means pretty well anytime. 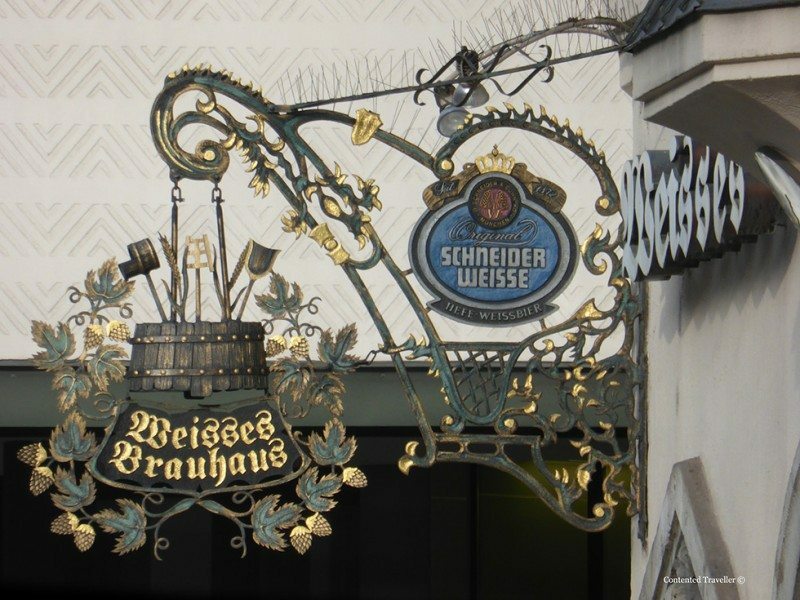 It is probably not dissimilar to us drinking tea, coffee or alcohol. What it is said to do is to create a feeling of great ease and mellowness and if ‘Fiji time’ is anything to go by, then kava works. 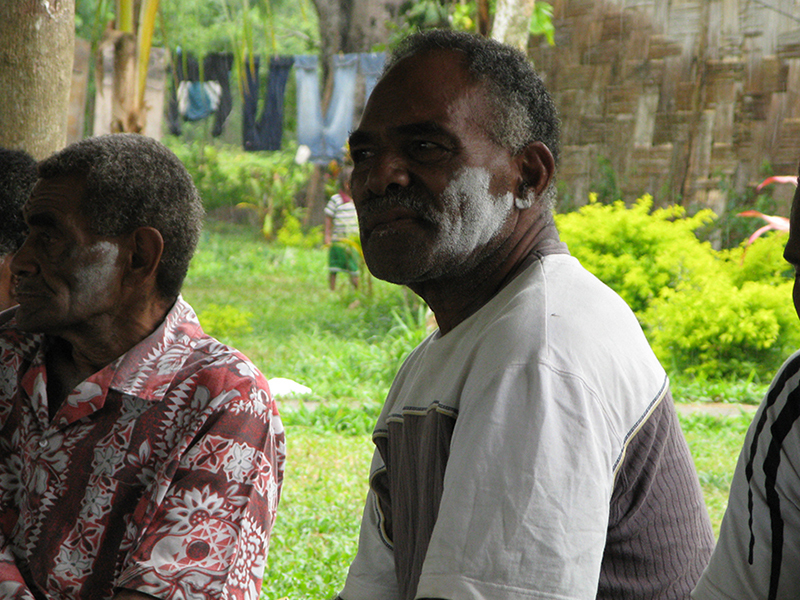 The Fijians are happy people who would do anything for you, just when they are ready. This is called Fiji time and is worth getting used to. If you need kava to adjust then you should drink some which is freely available everywhere. We went to a sevu sevu, which is an important traditional Kava ceremony for the guests attending. When we arrived at the village, the village elders, the mataqali, needed to be asked to accept us by our host. In accordance with tradition, we took some kava root with us as a gift. This Kava will either be used at our sevu sevu ceremony or be accepted and then stored while another Kava is utilized in this ceremony. I couldn’t see what happened to it and wasn’t really watching as it was all so interesting. We entered the village where everyone must sit down and remain seated during the ceremony. The men sat in the foreground while the women and the children sat behind. I had to sit behind cialis purchase in uk Gordon. It is what it is. The sevu sevu ceremony involved our host requesting the Chief of the village to accept us as members of the village. 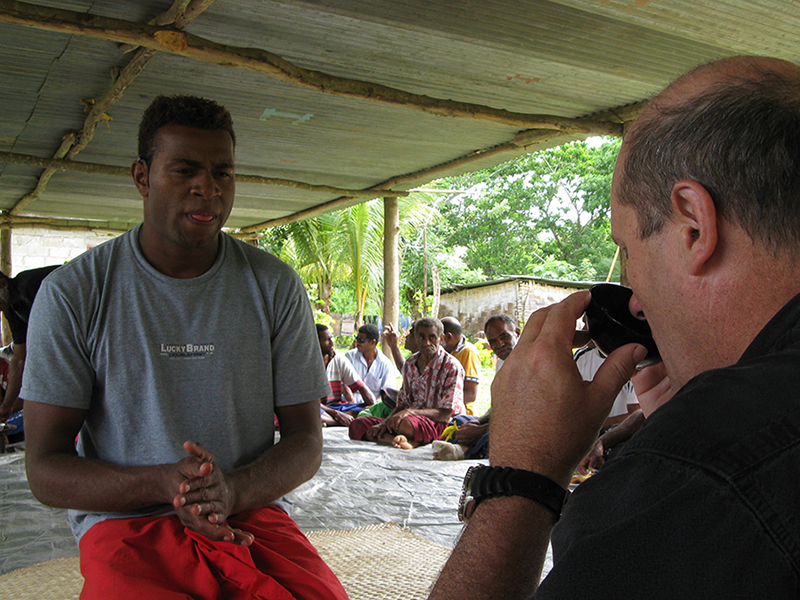 Our host then passed the kava root to the chief and the chief spoke in Fijian to him. We were waiting and then he said “vinaka”, thank you” and we knew that we were accepted. It was all very serious and a little nerve-racking during the whole process but in a very good way. We were now members of this village. A number of things were going on, but we were unsure exactly what. The kava was prepared amidst much ceremony and clapping, and then the men preparing the kava bowl clapped 5 times to alert everyone that the bowl was about to be offered. The chief was offered the first drink and then another man, as it goes in importance, and then Gordon was offered it. He was a guest, so he was next. We had been told about the etiquette, so Gordon asked for a “low tide” that is half a bowl of kava rather than a “high tide”, a full bowl. He said “Bula” and cupped his hands and clapped them together, and then as he had been told, he drank it all down in one go. This is important to remember. No sipping and no screwing up your face. He then said “vinaka” and handed back the bowl and clapped three more times as per etiquette. It was quite acceptable for me to decline to drink kava, and the villagers were not offended, but … once you have the kava bowl in your hand, then you are bound to down it in one go. We had lunch with the villagers and then danced the afternoon away with our new village friends, walked around and talked to the children. The men kept retuning to the kava though I don’t think Gordon had any more. I asked him what it was like and he said it did have his tongue tingling, and his mouth was a little numb. When I asked to describe the taste of the kava, he said “muddy water that’s got an unpleasant taste to it”. I know however that he did sleep very well that night. That is How to drink Kava In Fiji. I didn’t try kava; I made my husband. It is an experience for sure in Fiji. I’d have been so worried about getting the etiquette wrong but I would have had to try some. Good to know you can ask for half a bowl though! I recently tried Feni for the first time in Goa (an alcolholic drink from the palms) and while my travel companions all pulled funny faces and really, really hated it, I actually liked it. I was told that isn’t normal as it’s an aquired taste and the locals were amazed I liked it. So I tried it again a couple of times more to make sure and I most definitely loved it! I like to see a girl who will try new things ..again and again. I would be with you Paula, I’m not going to touch the stuff. Although I am surprised it wasn’t as potent as I thought it would be. Got to get me to Fiji… if not for the kava then to watch the ceremony. The ceremony is the most exciting part.I loved how it was so bound up in tradition. I didn’t know Kava is a drink offered in Fiji islands. Sounds interesting. 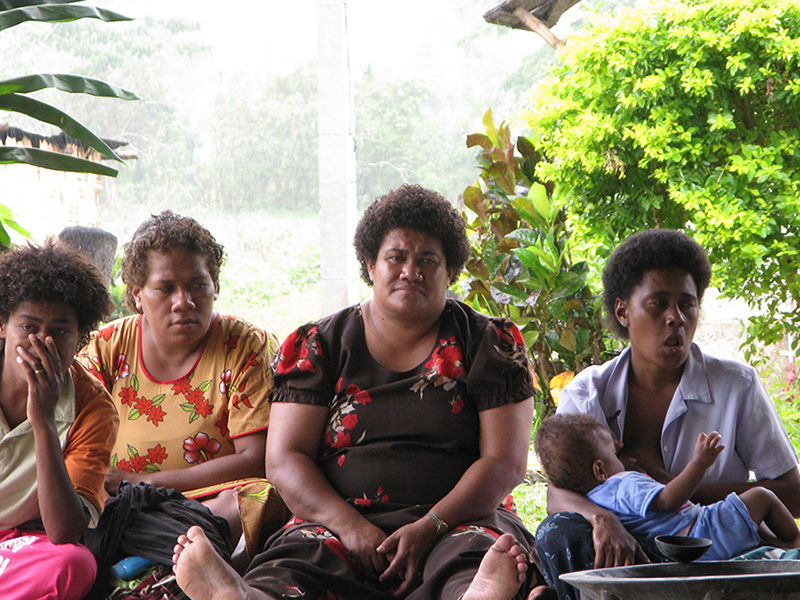 Most of the South Pacific islands have kava. It is becoming a problem some say, or are we just imposing western beliefs on a traditional practice. Tough call. Would they had been offended if Gordon declined? Is there an age restriction for drinkers? Very interesting ceremony. No I think that they would have respected that and probably laughed behind his back 🙂 I don’t believe there is an age restriction, though I have heard of attempts to tighten control. Wow, very interesting ceremony. What a wonderful experience! Thanks and it was totally absorbing. Very ritualistic. Paula, It’s great that you got to enjoy the ceremony without any worry of side effects. Gordon, what a trooper! The sacrifices we make! I love being part of the local ceremonies and learning their culture….lucky they had a low tide on this occassion!